Southern-Style Pecans: Nothing says you’re in the south like Pecans, and i thought you might like to know i cracked every single pecan ( 40+ lbs.) using an old fashioned nut cracker! It took several consecutive hours spread over a few days but that’s how dedicated i am to my CSA members ;). The truth it’s hard to tell a nut by its shell. 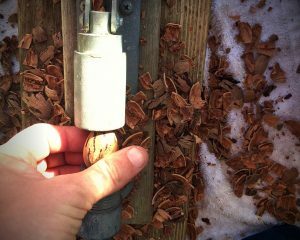 The only way to determine the quality of the pecan is to crack it open. Some were easier to crack than others and a few were disappointing and shriveled up but the majority of them were perfect. They should be pretty easy to shell now that they are started and as most of them are already broken.. may i suggest sprinkling them over your cooked dishes and on salads. If you feel up to it try them roasted! Simply coat them in a little melted butter, salt, and toss them on a baking sheet. Bake in the oven at 300 degrees for about 30 minutes, stir the pecan bits every 15 minutes to allow them to roast evenly. Sprinkle them over your green beans or sweet potatoes. Yum. Purple Daikon Radish: Eat it raw in salads to enjoy the intense spicy flavor. For a milder flavor cook it as you would a potato in curry, soups and stews. Don’t forget to eat your greens! Chop and cook your Radish Greens alongside your Mustard Greens. Update- To maintain the quality of our produce we and pick & pack all of our vegetables the morning of the delivery, unfortunately Thursday morning we were unable to harvest our squash. The Avmed, UF, and Cypress and Grove Brewery members will be getting cucumbers in place of the squash. 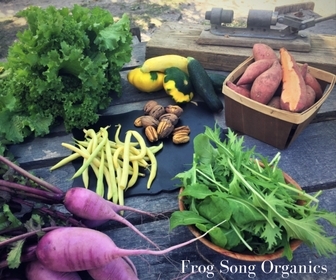 Enjoy the cucumbers, we will make sure to include squash in your share next week. 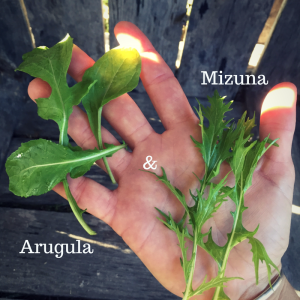 Mizuna/Arugula Mix: Hold on to your taste-buds! This peppery mixture is a great topping for sandwiches or soups, a zesty addition to your morning eggs, or toss it in your favorite dressing and serve with some shaved daikon radish from your share. Mustard Greens: EAT YOUR GREENS!! As an excellent source of antioxidants, vitamin C, vitamin E, vitamin A (in the form of carotenoids), and manganese, mustards are increasingly looked upon as a comprehensive health benefit provider. Braised, stir fried and steamed are the most popular way to eat these greens however you can eat them raw….If you need to clear your sinuses. Tulsi Basil (not pictured)- Try a Tulsi Basil Mojito! -In the same family as mint (the usual choice for a mojito), holy basil takes the cocktail a step further, adding hints of clove and anise. Follow these simple directions: In chilled glass, delicately muddle the leaves and flower of your basil with 2 tablespoons of sugar. Add 1½ ounces rum, 1 tablespoon lime juice, and stir (or shake). Fill glass with ice and top with ¾ cup sparkling water. Enjoy.